Green Hill trapped in the White Space. White SpaceMedia:SonicGenerations 360 UK manual.pdf is the main setting of Sonic Generations. It is a timeless white void between dimensions where all of the game's levels are sent to after they have been ripped from their place in space-time by the Time Eater. After Sonic's birthday party is ruined by the Time Eater, Sonic and his past self are banished here. 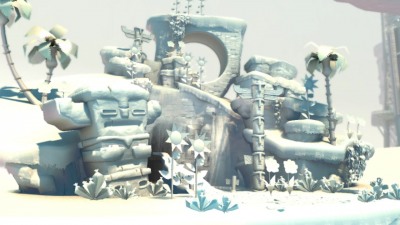 White Space serves as the hub world for the game, having access to all stages, Challenge Acts, boss battles and other features. The hub is split into multiple areas based on the eras of Sonic's life. Located before the Classic Era are the Skill Shop, Information Pod and Gallery, and located beyond the Modern Era is the Lair of the Time Eater where all seven Chaos Emeralds are required to access the final battle. In the PlayStation 3, Xbox 360 and PC versions of the game, White Space functions as a level you can roam around in as either Classic Sonic or Modern Sonic, while in the Nintendo 3DS version, it is a menu. At the end of the game, all the places and characters that have been displaced by the Time Eater are restored to their proper places in space-time, leaving Dr. Eggman and his past self stranded in the now-completely empty white void. This page was last edited on 2 April 2019, at 08:23.